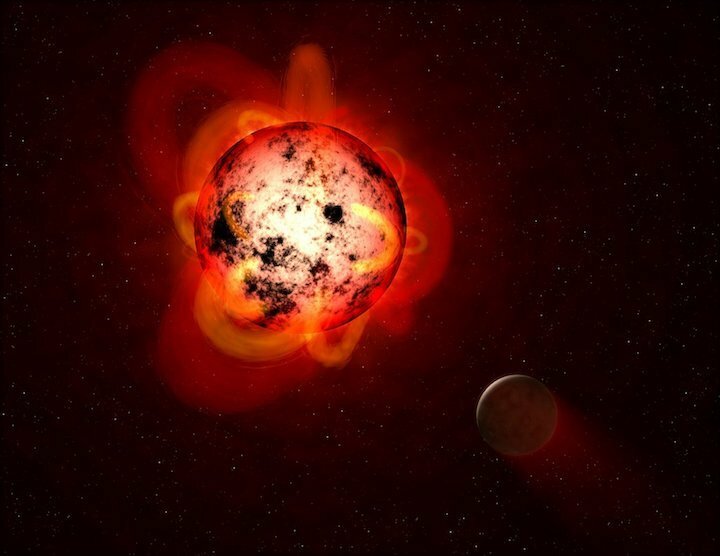 Low-mass stars are currently the most promising targets when searching for potentially habitable planets, but new research has revealed that some of these stars produce significant amounts of ultraviolet (UV) radiation throughout their lifetimes. Such radiation could hinder the development of lifeon any orbiting planets. Detecting terrestrial planets in the habitable zone — the region where liquid water can exist on a planet's surface — when they pass in front of, or transit, Sun-like stars is difficult. This is partly because we only see a small dip in the light as the planet crosses the star, and also partly because their orbits are long enough that we have to wait several years to observe multiple transits. However, because M-dwarfs are smaller and cooler, the planets in their habitable zone are much closer to their star, resulting in larger and more frequent drops in light, making them easier to detect. This makes M-dwarfs ideal candidates when searching for potentially habitable planets, which has led to habitable zone terrestrial planets being discovered around M-dwarfs including Proxima Centauri, TRAPPIST-1 and Ross 128. A paper by astrophysicists Adam Schneider and Evgenya Shkolnik from Arizona State University, recently published in The Astronomical Journal, has revealed that the hottest and most massive M-dwarfs, referred to as 'early type', emit different amounts of UV radiation over their lifetime compared to the less massive and cooler 'mid-' and 'late-type' M-dwarfs. The paper used observations from NASA's Galaxy Evolution Explorer (GALEX) spacecraft to study several populations of M-dwarfs in ultraviolet light. The aim of the 'Habitable Zones and M-dwarf Activity across Time" (HAZMAT) program is to use UV observations to understand how the habitability of low-mass stars changes over time. The researchers used GALEX to observe a large sample of M-dwarfs with known ages between ten million years and five billion years old. "If the amount of stellar UV flux incident on a planet is harmful for life on that planet, then early-M dwarfs may be more desirable places to look for real estate," says Schneider. "But, it is very likely not that simple. At first look, it may seem that our work suggests that stars such as TRAPPIST-1 and Proxima Centauri may be less likely to have habitable planets because of the prolonged UV activity of the lowest mass stars, but the notion of habitability is extremely complicated and there are many other factors besides UV flux that must be considered." The study "HAZMAT. III. The UV Evolution of Mid- to Late-M Stars with GALEX," was published in The Astronomical Journal. The work was supported through NASA's Habitable Worlds Program. NASA Astrobiologyprovides resources for Habitable Worlds and other Research and Analysis programs within the NASA Science Mission Directorate (SMD) that solicit proposals relevant to astrobiology research.